Book Summary: Of the forty-four presidents who have led the United States, nine made mistakes that permanently scarred the nation. Which nine? Brion McClanahan, author of The Politically Incorrect Guide to the Founding Fathers and The Founding Fathers' Guide to the Constitution, will surprise readers with his list, which he supports with exhaustive and entertaining evidence. 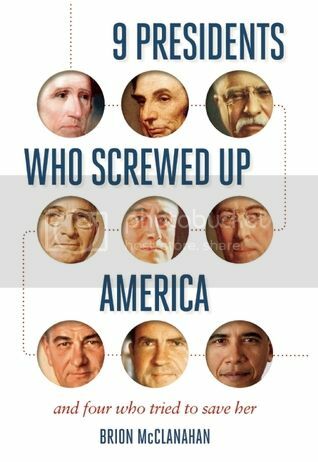 9 Presidents Who Screwed Up America is a new look back at American history that unabashedly places blame for our nation's current problems on the backs of nine very flawed men. Book Review: This book was really hard for me to like. It does touch up on some good points that presidents have overreached their executive power but I don't think the author realized that Constitution is vague when it comes to limiting much of the power of the president. Most presidents have probably read the Constitution but drawn on their conclusion as to what exactly they can and cannot do when it comes to their own presidency. In times of war, some presidents might overreach their power. Abraham Lincoln ordered the writ of habeas corpus during the Civil War because he was hoping to stop the rebellion in the South. Maybe that was the only way in his mind that would, hopefully, end the war. Of course many scholars might see this as an overreach and might even see him as using his presidential power far beyond the scope of what our Founding Fathers might have considered but you also have to consider that Presidents in both war and peace will use their presidency power with the demands of the times. Sometimes this is good and sometimes this could be looked at as bad. I don't think these presidents did much wrong. If McClanahan really wanted to look at presidents that screwed up America, he might look at the ones who did nothing that led up to the Civil War. This book made me roll my eyes and put it down several times because I think the author's biased toward Cleveland and Coolidge to the point he thinks they seem to the better presidents the U.S. has ever had. Still if you like history as much as I do, then this book will be for you.